CS:GO abruptly went free to play and added a battle royale mode called Danger Zone on Thursday. 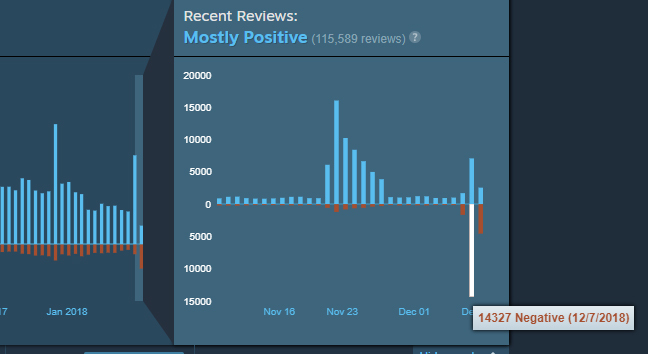 The immediate reaction hasn't been great: 14,327 negative Steam reviews flooded the CS:GO store page on December 7 alone. That's more negative reviews for CS:GO in a single day than in any entire month since Steam added a user review system back in 2013. Another 4,000+ negative reviews have appeared so far today. Most of the new negative reviews point to the free to play model rather than the new battle royale mode. Some players are unhappy that a game they spent money on is now free for anyone who wants to play (even, in some cases, players who have owned the game for years and have played for thousands of hours). Others were hoping for more of a reward than the loyalty badge they received for having purchased the game prior to Thursday—some reviewers feel they are entitled to an exclusive skin or weapon. Many are convinced that going free to play will result in a sudden influx of cheaters and hackers. There are a number demanding a refund for the purchase price.